It’s been two and a half years since Gov. Jerry Brown jolted the debate on California’s housing crisis by saying much more private-sector construction was the only realistic way to address the crisis, not the old Democratic recipe of building a relative handful of subsidized housing units that help a small percentage of those in need. “We’ve got to bring down the cost structure of housing and not just find ways to subsidize it,” he said in January 2017 in criticizing previous state policies. Brown sought to make it much easier for home-builders to clear regulatory hurdles. In September 2017, Senate Bill 35 by Sen. Scott Weiner, D-San Francisco – which reflected the governor’s priorities – was enacted. It holds that cities could not put up new obstacles to projects with proper zoning so long as they contained at least 20 percent of units at lower price levels. And in the last two months, Brown has signed a series of new housing measures with similar goals – most notably Assembly Bill 2923, which will make it much easier for the Bay Area Rapid Transit authority to follow through with its plan to build 20,000 new housing units by 2040 on 250 acres BART owns nears its transit stations. But when it comes to Tuesday’s election and major housing initiatives, it’s back to the old Democratic playbook. Both the key measures meant to increase housing – placed directly on the ballot by votes of the Legislature – involve government-subsidized construction. Proposition 1 authorizes the issuance of $4 billion in general obligation bonds. The biggest chunk – $1.8 billion – would go toward building apartment-type residences. $1 billion would go to loans to veterans. Both infrastructure and homeownership programs would receive $450 million each. And $300 million would go to build housing for farm workers. The official state voting guide’s analysis estimates that this will create access to housing for 55,500 families. Proposition 2 would allow the state to divert funds from 2004’s Measure 63 – which generates about $2 billion a year for mental health programs from an income tax surcharge on the very wealthy – to pay back over 30 years up to $2 billion in bonds to build housing for the homeless and those at risk of being homeless. The official state voting guide’s analysis doesn’t estimate how many people would gain housing as a result. But based on Proposition 1’s estimate that $1.8 billion could create about 30,000 apartment units, $2 billion should be able to provide around 33,000 units. The combined net effects of the two measures: providing housing to about 88,500 families over the life of the two bond measures in a state that a 2016 McKinsey consulting group report said has a shortage of 2 million housing units. The small increases in housing that Proposition 1 and 2 would create are consistent with the criticisms that have been made of California’s state housing policies since at least 2003. 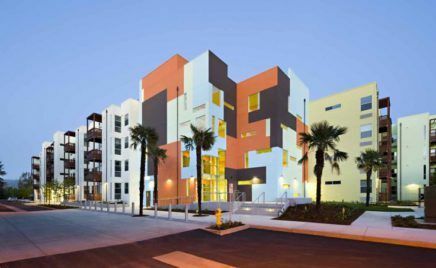 That’s when the Public Policy Institute of California released a report that said affordable housing programs focused much more on establishing a process for such housing than on actual results. It said it was “unrealistic” to think such an approach could have a significant effect in increasing affordable housing. No recent polling has been done on Propositions 1 and 2, but they’re widely expected to pass easily. That’s in keeping with the record of bonds placed directly on the ballot by the Legislature.